Hello everyone, it's Perrin Ireland reporting back from my recent trip to Raleigh, North Carolina, for the ScienceOnline2012 Conference. Journalists, bloggers, scientists, science artists, advocates of open science, librarians, data specialists, and everyone in between showed up for the seventh year of this event. It's a really great community of people who support each other's work online disseminating high quality scientific information and commentary. For this year's conference, I helped contribute part of the visual presence at the conference. Saleem (@kidethnic) shows off his scribing...During the first session slot on Day One, I led a Science Scribe Sketchnotes workshop, and taught a group of people the basics of visual note-taking. 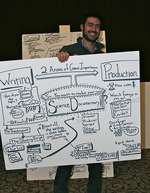 They went out and did an incredibly impressive job visually capturing the rest of the conference in their notebooks. Some of them even jumped on foam core on easels to capture sessions, which I too was doing for the rest of the sessions during the conference. It was such a treat to come back into the Cafe and see people standing by the boards discussing sessions they hadn't seen or brushing up on some of the finer points of sessions they did attend. I got a lot of feedback that it was great to see what went on in the sessions people weren't able to attend. I am passionate about empowering other people to use doodles to make content more accessible and fun. Thank you so much for this opportunity, #scio12! Michele Arduengo struts her stuff. Our work is all online, at http://scio12.com/2012/01/22/sciscribing-from-scio12/. You can also check out the Flickr photostream of this work: http://www.flickr.com/search/?q=sciencescribe. 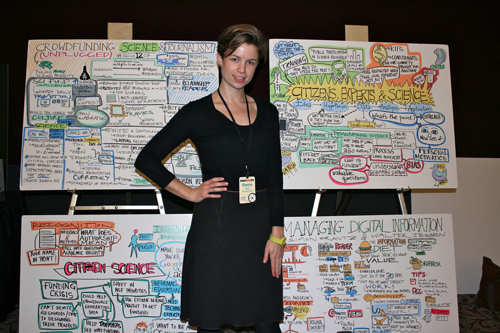 I was blown away by the support and positive feedback our visual documentation was met with, and cannot wait for ScienceOnline2013.